We knew the Russians were making out like bandits with chintzy Auburn merchandise designed with poor attention to detail, but apparently they’re not the only ones. Here’s a photo of an Auburn shirt spotted recently in Thailand that could totally be a “What’s Wrong?” feature on the back of a Highlights Magazine (how many errors can you spot?). 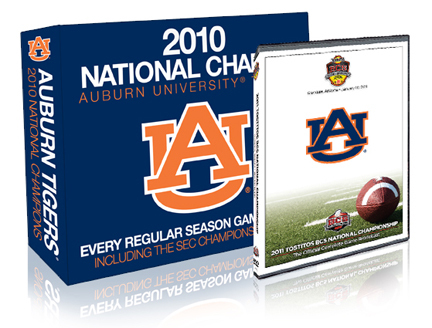 How ironic you included the promo for the 2010 Season DVDs in an entry for an errant T-shirt, as the set I’ve seen had the misnomer “University of Auburn” printed on the actual disks. Someone at XOS Digital should be beaten. I am willing to pay 328.85 Thai baht, plus shipping, for someone to send me that shirt. It looks like a flying suplex is a cosmic pro wrestling move. Perhaps it’s something for the linebackers to try next fall? 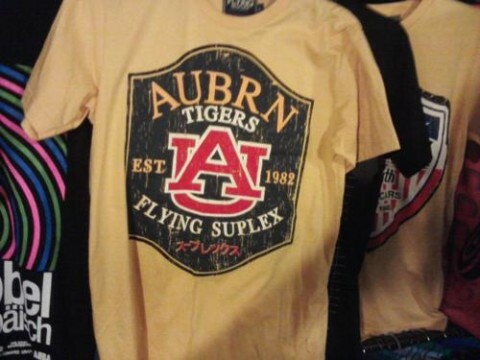 flying suplex- what happens when wareagletigersplainsmen gets translated into thai and then back into engrish. Yes, Pat I’d like to buy a vowel…a “U” please. Looks like we were found in 1982… The year of Bo Jackson. I’m going to Thailand next month. I’ll pick up as many as I can carry back if I run across any. That would be awesome, Michael. I was founded in 1982. I deserve that shirt. At least they spelled Tigers right. The script at the very bottom is actually Japanese katakana (phonetic characters for words “borrowed” from other languages, in this case, borrowed from English). it with a “k” sound as in the “k” in “stinks”. Brant is correct on the Katakana translation.